An artist's concept of the Hinode spacecraft in its low orbit around Earth during the sun's uneclipsed activity. As people across the United States scramble for a good position to observe the solar eclipse this Sunday (May 20), a Japanese satellite will get great looks from orbit. The Hinode spacecraft will cross the path of Sunday's annular solar eclipse a total of four times — and it won't have to worry about its view being blocked by any pesky clouds. No other sun-observing satellite will be able to watch the dramatic event. "Given the low altitude of the orbit, if Earth is eclipsed, so is the spacecraft," said Jonathan Cirtain of NASA's Marshall Space Flight Center in Huntsville, Ala. Cirtain is a co-investigator for the X-ray telescope onboard Hinode. On Sunday, the moon will pass in front of the sun from Earth's perspective, blocking out about 94 percent of our star's light. Because the moon is near apogee at the moment — the most distant point in its orbit around our planet — it will be too small in the sky to cover the sun's face completely. So favorably placed skywatchers will be treated to an annular solar eclipse, in which a ring of sunlight blazes around the moon's circumference. Weather permitting, the annular eclipse will be visible from parts of East Asia, the Pacific region and western North America. Other areas will see a partial eclipse; check out this video for skywatching tips. And by all means, be careful. NEVER look at the sun — either with the naked eye or through a telescope or binoculars — without proper filters or other equipment. Serious and permanent eye damage, including blindness, can result. The Hinode spacecraft, named for the Japanese word for "sunrise," orbits the Earth from pole to pole, less than 400 miles (630 kilometers) above our planet's surface. Because it is constantly zipping around the Earth — rather than hovering over a single point — it will travel through the path of the eclipse four times. Each pass will keep it within the eclipse shadow for 10 to 15 minutes, providing ample opportunity to collect information about the sun. Hinode carries the first large optical space telescope dedicated to studying the sun, researchers said. It also boasts an X-ray telescope to provide full and partial images of the sun's outer atmosphere at a variety of temperatures, and an instrument called the Extreme-ultraviolet Imaging Spectrometer, which measures the speed of gases traveling in the sun's atmosphere. 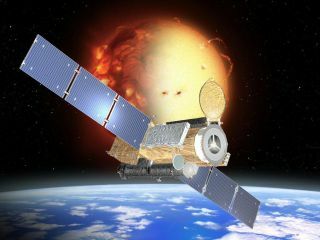 Launched in 2006 by the Japan Aerospace Exploration Agency (JAXA), Hinode has exceeded its three-year mission to study the magnetic energy of the sun, but it continues to monitor our star. Hinode is a joint mission between JAXA, the National Astronomical Observatory of Japan, NASA and the Particle Physics and Astronomy Research Council. Hinode's view of the eclipse will give scientists a valuable opportunity to study the sun. "You can lean a heck of a lot from solar eclipses," Cooke told SPACE.com. "People have used them to great success." As the moon blocks out the most of the sun's disk, it will reveal the outer atmosphere, called the corona, which is normally hidden by the sun's bright light. During the eclipse, faint features of the corona will be visible in high resolution. Neither NASA's Solar Dynamics Observatory nor its Solar and Heliospheric Observatory spacecraft, both dedicated to studying the sun, will be able to view the eclipse. "The Hinode observations will be the only space-based observations of the event," Cirtain told SPACE.com via email. If you snap a great photo of Sunday's annular solar eclipse and would like it to be considered for use in a story or gallery, please send it to SPACE.com managing editor Tariq Malik at tmalik@space.com.